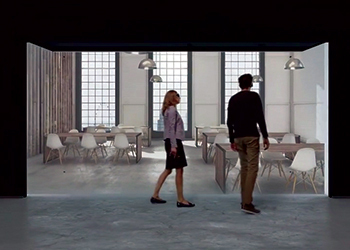 Reynaers’ VR room ... enables concepts to be visualised and experienced. Reynaers Aluminium recently launched a virtual reality (VR) room at its headquarters in Duffel, Belgium. Called Avalon, the room at the Reynaers Campus will serve as a sophisticated, state-of-the-art promotional tool to introduce the leading European aluminium solutions provider and its diverse range of versatile products to its potential clients. In line with this goal, Reynaers Middle East, the Bahrain-based regional office of Reynaers, will be organising visits by early 2018 to the headquarters to enable prospective clients to experience first-hand the VR room. “Architects, developers and fabricators can provide the details of their projects in advance to be able to experience the look and feel of their buildings through virtual reality and make changes or enhancements to their project plans through live simulations,” said Ali Khalaf, managing director of Reynaers Middle East. This powerful tool radically changes the way the design of a building is evaluated and visualised, Khalaf claims. Avalon is a high-end projection-based VR room, specifically configured for architectural applications and for groups of up to eight people. Five-sided projection immerses the user into an ultimate VR experience. Its 25 projectors with leading-edge laser technology create vivid high-resolution images that give form to the customer’s architectural ideas that can be viewed through 3D glasses that track the user’s movements, generating the 3D-illusion but still allowing him to see the people around. Avalon turns an architectural 3D model into a virtual model. The VR room’s powerful cluster of computers allows it to handle complex architectural models and process real-time rendering. The dedicated middleware software can display files of more than 200 commonly used applications such as Revit, ArchiCad, SketchUp and Navisworks as high-quality, fully navigable virtual models. While the user navigates through the model with a control stick, the operator can still make changes in the design software. • Concept evaluation: Early concepts can be visualised, experienced, evaluated and adapted simultaneously. 3D models can be seen up close and changes made on the go. By using real-time design evaluation, variants can be tested and time and costs can be reduced. The software used includes SketchUp, Autodesk Revit, Graphisoft’s ArchiCad, Autodesk 3DS Max and Enscape. • Technical evaluation and BIM: 3D models can be watched up close to evaluate and discuss all kind of technical issues. VR can help visualise, understand and evaluate extremely complex files, said Khalaf. 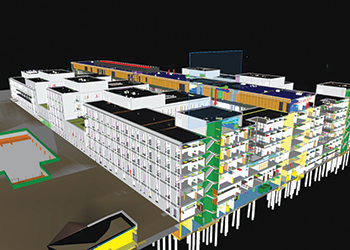 “Users can navigate through complex BIM (building information modelling) models and perform clash detections. Detection of building mistakes early in the process reduces cost and improves efficiency drastically. The software used here include Autodesk Revit, Archicad and Autodesk Navisworks,” he added. • High-quality design evaluation: VR allows to move inside the simulated environment and inspect it closely. Navigable rendered scenes can be used to evaluate the design. Natural and artificial lighting conditions, furniture layouts, surrounding and materiality are some of the features that can be modified within the VR environment. The software used is Unreal Engine 4. Furthermore, the VR room creates an ideal environment for joint experience and collaboration between architects, investors, contractors and Reynaers experts. Different stakeholders of a project can be brought together for a virtual visit and for 3D-evaluation of buildings and solutions. “Avalon turns an architectural 3D model into a virtual model, enabling users to review all kinds of design and technical aspects from inside or around the building. Changes to the model can be made real-time, allowing the customer to evaluate the different options in the most realistic way and improving the decision-making process,” says Khalaf. Additionally, a dedicated generic model of a high-rise office building or a private house is created to be able to exchange, configure and experience Reynaers products in a most realistic 3D building environment. Avalon can also be easily turned into a dedicated project meeting room to watch and discuss different files from different partners by switching from 2D to 3D view and back.